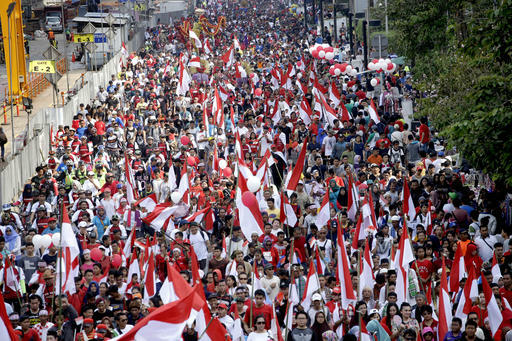 JAKARTA, Indonesia (AP) — More than 10,000 Indonesians took to the streets of their capital to call for tolerance and unity in the world’s most populous Muslim nation, after police opened a blasphemy investigation into the city’s Christian governor. Earlier this month, Jakarta was rocked by a massive protest by conservative Muslims against the popular Gov. Asuki “Ahok” Tjahaja Purnama, with one person killed and dozens injured in rioting. Hard-liners have threatened more protests if Ahok isn’t arrested. Police last week named Ahok as a suspect in the blasphemy investigation. The rally Saturday November 19, 2016 attracted more than 10,000 people, including religious leaders, legislators and members of human rights groups, who marched at the National Monument and along nearby main streets. “We are gathering here not to protest but to show that we are not easily divided by religious or political issues,” said Budiman Sujatmiko, a legislator from the Indonesian Democratic Party of Struggle, the country’s largest political group. The Islamic Defenders Front, a vigilante group that wants to impose Shariah law in secular Indonesia, began demanding Ahok’s arrest after a video circulated online in which he joked to an audience about a passage in the Quran that could be interpreted as prohibiting Muslims from accepting non-Muslims as leaders. The governor has apologized for the comment. Blasphemy is a criminal offense in Indonesia. Amnesty International documented 106 convictions between 2004 and 2014, with some individuals imprisoned for up to five years. Ahok is the second Christian governor of Jakarta since Indonesia declared independence in 1945, and the first ethnic Chinese to run the sprawling, chaotic city. He is popular with the city’s middle class, but has made enemies from a tough stance against corruption and an urban program that has evicted thousands of the city’s poorest from slums. Tags: Ahok, Budiman Sujatmiko, jakarta, police, rally, tolerance and unity. Bookmark the permalink.